Suddenly, there it is. An in-page editor that says 'start writing your post here'. Well, why not? But still, it's a strange thing. Am I writing a post on somebody elses website now? How can that be? Did this Tynan, of whom I had never heard before just a few minutes ago, mess up the permissions for his CMS? Well, whatever it is, I'm attending a meditation group at eight, and before that there's some other stuff I need to take care of, including fueling my body with some delicious food. So however strange this opportunity may be, I'll sign off now. Maybe another day. My wife and I lived out of our 1996 Winnebago Rialta last year quite a bit. We put solar panels, a charge controller, some decent AGM batteries, etc. in it. The transmission died, however, and we just don't have the cash on-hand to get it fixed. It's stuck in a driveway in the Bay Area in California. For $3k, you can have it, as long as you come and haul it off, or cover expenses to do so. The title is clean. Full disclosure: we haven't officially determined that the problem is the transmission, though that's what people in the know have told us. The engine starts, but the car won't move forward or backwards. Thoughts on My Habit Building Process? Each month, I publish a list of the habits I’m currently trying to establish in my life on my blog (like “only do one cheat meal per week”) and document my day-to-day successes and failures via Google Docs. And then I punish myself for the latter ones… $10 for every single time I didn’t stick to a habit. Great book Tynan, thanks for writing it! 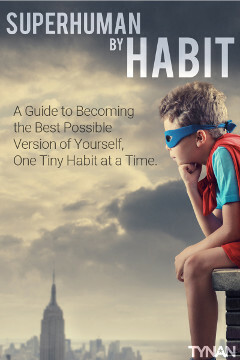 I finished your book on habits recently and gained an immense amount from it. Though, one thing that I felt was lacking was a discussion on what is to me the most danger to the livelihood of new habits: The weekends. I have a solid list of triggers that I go through on weekdays that 95% of the time gives me good results and a near 100% completion of all habits. The triggers are highly tied to the fact that I come to the office to work every morning. On the weekends I lose all of these triggers, and I'm lucky if I even get out of bed on time. My habit tracking highly reflects this truth. I realize you don't have weekends because you work from home and keep a mostly constant schedule, but to the average 9-5er this problem is the equivalent habit-buster to having to travel every single weekend. It throws you in a chaotic situation where your triggers aren't around to help.